This was a very brief visit to Paris because cheap Eurostar tickets were available (well- they would have been cheap had I not mucked up the booking!) and I always have fun out there. Just the weekend as I've exhausted my leave allowance for the year! Out on the 08:01 Eurostar from St Pancras with 3213/3214- breakfast on board as my waking up failure had resulted in a rather rushed leaving of the house to say the least! 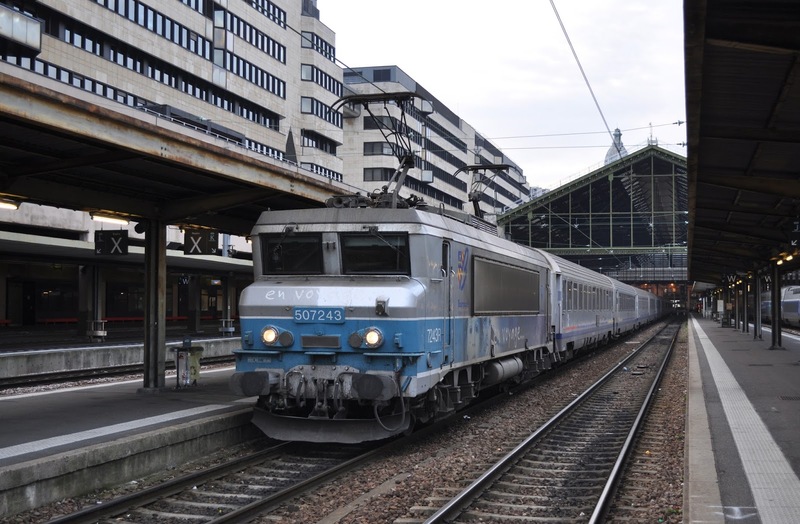 Loco hauled trains within the Paris zone are no longer quite so easy to come by these days, especially at weekends- however the diagrams had revealed the 12:13 from Nord to Crepy en Valois should still be a BB17000- Sure enough it was. I took up residence in the 'hanging area' at the front of the train and enjoyed the ride to Mitry Claye. I would have gone further but it became apparent that the line ahead had been closed due to an 'accident'. I cannot therefore report if the afternoon turn beyond Mitry Claye is still hauled or not as RER B had to come to the rescue to take me back into the city. 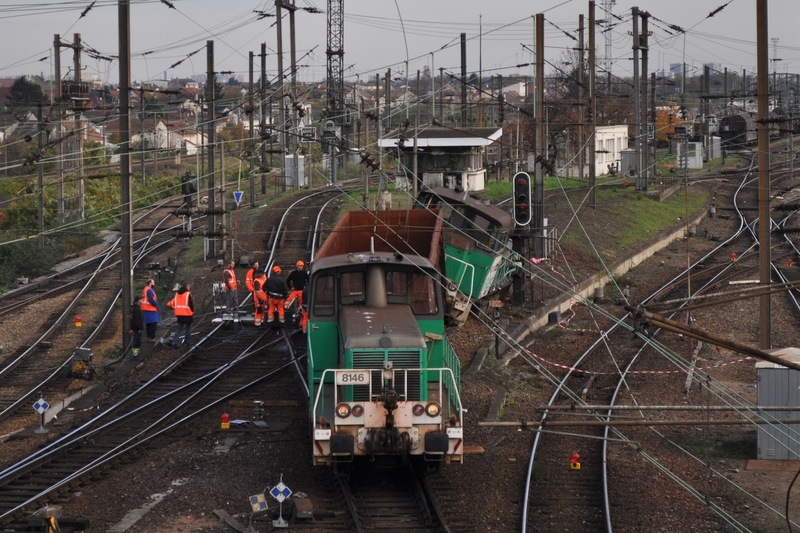 This was not the only 'accident' in the area- a large contingent of orange vests were gathered around shunter 8230 which had put itself in the dirt on the hump in Le Bourget yard! the dirt on the hump at Le Bourget. With an earlier arrival back into Paris than I expected it was time for a bit of sightseeing before heading over to Nogent le Perreux to photograph inbound CC72180 off the 14:12 ex Troyes. Interestingly there seemed to be a lot of freight on this line- something which I have never seen before here. In the space of an hour there were two trains each way- Sybic 26039, VFLI 27111, ECR Traxx E186-176 and another unidentified ECR Traxx. Of course I wasn't in a good position to photograph any of them. Is it usual to see freight here? My theory is that the normal 'freight loop' which runs east of here must have been closed for the weekend? Next stop was over to Gare de Lyon for a couple of locos on Mobilis to Melun. BB7243 produced on the 16:43 to Larroche Migennes with BB7409 returning me on the 15:46 off Laroche Migennes. Both locos had some interesting doors- the first with a Beton door set against an 'En Voyage' loco- the second just having it's 'En Voyage' doors at the wrong end. Most odd! I made it back to Paris Est just in time to miss the departure of the 18:42 to Belfort, however I did catch CC72145 arriving with the 15:21 from Vesoul. BB17098 removed the stock. BB17103 then arrived with the stock for the German sleeper- sadly just a few days left for this service now. 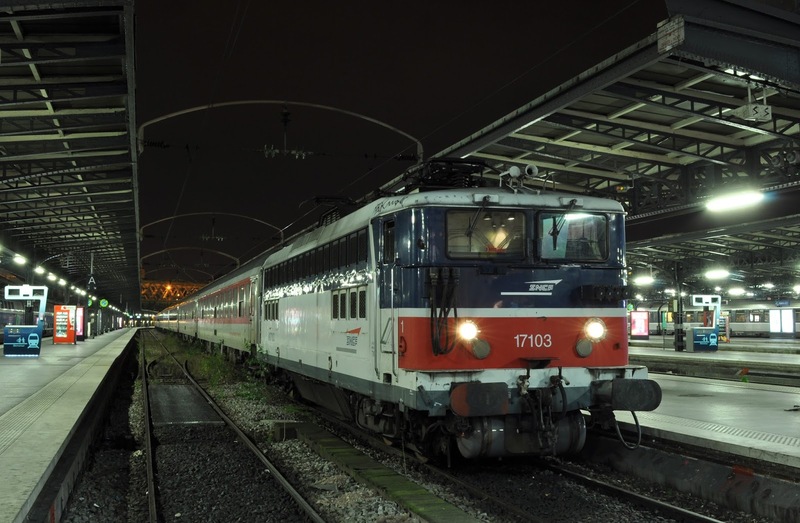 A sight about to disappear- as from 14th December 2014 DB's City Night Line will withdraw its daily train to Paris. 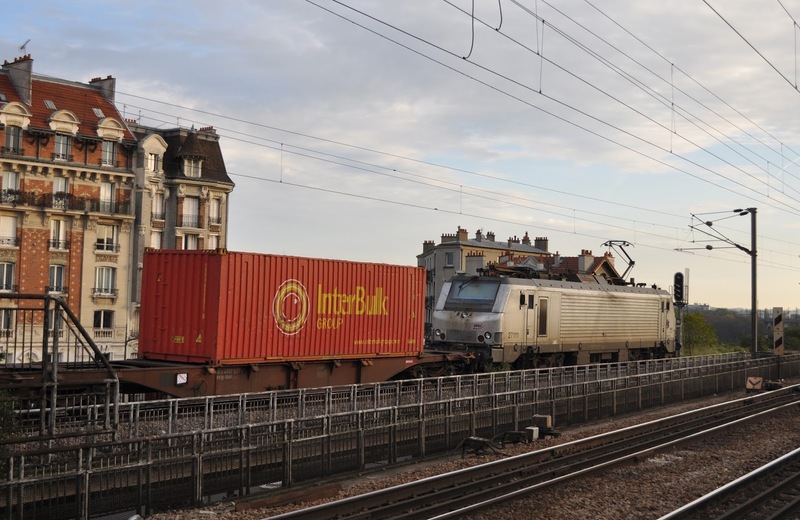 BB17103 has arrived at Paris Est with the stock for the overnight to Berlin/Munich/Hamburg- BB26004 will work the train. 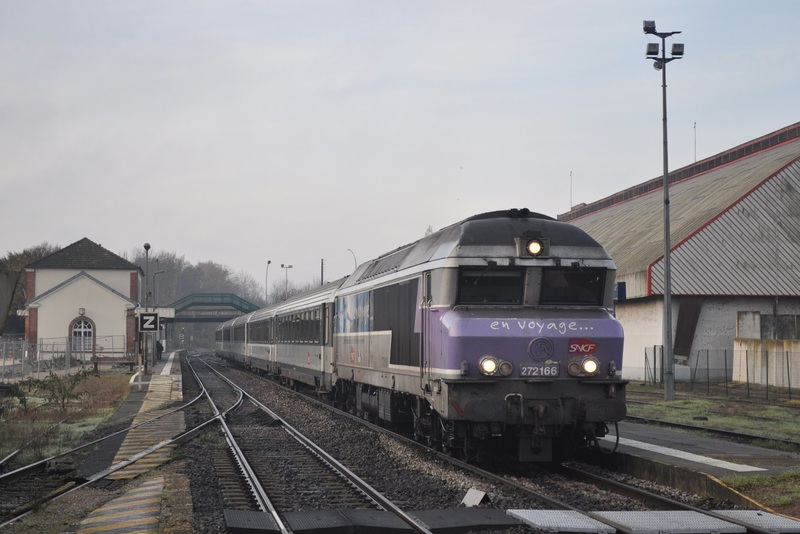 CC72166 at Nogent sur Seine with the 07:42 Paris Est - Belfort. As I was staying right next to it I popped into Gare du Nord to see if the stock was in for the 08:01 to Le Treport- this has previously been booked BB67400 but isn't at the moment. No sign of any stock, but the train was shown running through on the displays. Either way the mornings entertainment had already been decided and I made my way to Est for the 07:42 Belfort. Winner CC72166 was working this, which I took to Nogent sur Seine. 10 minutes later I was boarding the 06:44 ex Culmont-Chalindrey back into Paris with less winning CC72186. This is a very nice out and back move which only works on a Sunday. 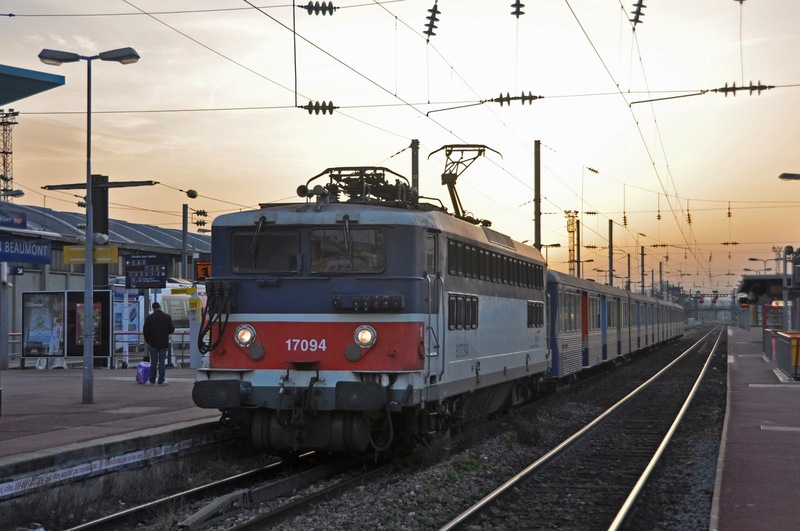 There really aren't many opportunities to get a 'quick' ride on the big diesels from Paris without having to endure a unit one way or a very long wait. On arrival back into Paris it was a quick dash across to St Lazare for the 10:31 to Rouen (calling at Mantes le Jolie for some more Mobilis mileage). Unfortunately this was not the loco I was expecting but with no premeditated 'B plan', and no sign of any BB17000's, I hopped on the unit anyway. The train was pretty full, not helped by bags on many of the seats- to be fair to the passengers there really wasn't anywhere else for the bags- double deck stock doesn't have a lot or room for luggage racks. Back at Mantes, and with the sun shining beautifully I decided I really needed to end up somewhere for some decent photos. I ended up spending the next few hours at Villens sur Seine. Not a lot happened really- and of course as I was about to head back to Paris when BB17046 appeared on the rear of a train heading to Mantes. I knew it would be back in 90 minutes so waited for it in the hope the sun would stay out for the shot I really wanted. It did- but most of the day was now gone and I had once ended up unable to buy lunch (I never worked out where the baguettes the locals were carrying had come from). 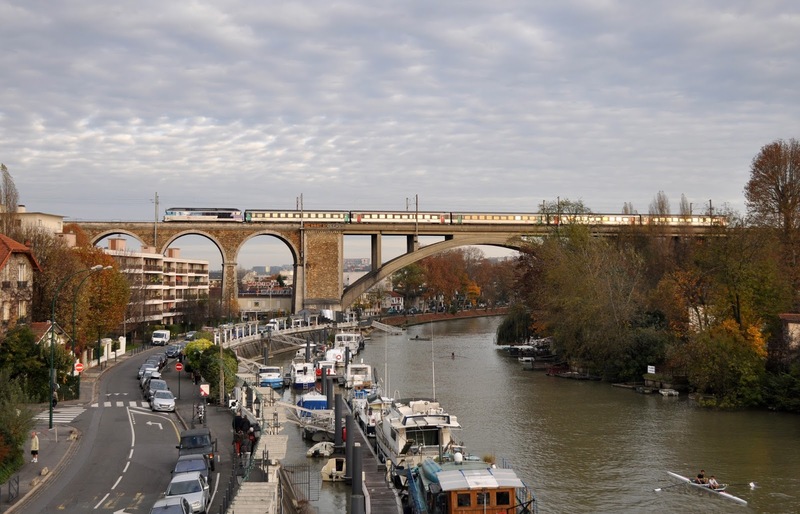 The shot of the trip- in perfect lighting BB17046 departs Villens sur Seine for Paris St Lazare. Covered a few winning 'Primas' before heading back onto the lines out of Nord in search of some more BB17000. Covered two of the three Creil-Pontoise turns after a long 'Francillien' journey with BB17094 and BB17053 producing (BB17073 also seen on the other diagram). The plan was then to take the 18:20 from Valmondois to Paris, shown hauled on the latest diagrams. Unfortunately the train no longer exists in any form. There was now little option but to endure another Francillien. These trains wouldn't be so bad if it wasn't for the ear-splitting door alarms! I really don't know how the commuters stand it- surely these trains have the most awful door sound in all of Europe if not the world!? I'm serious! 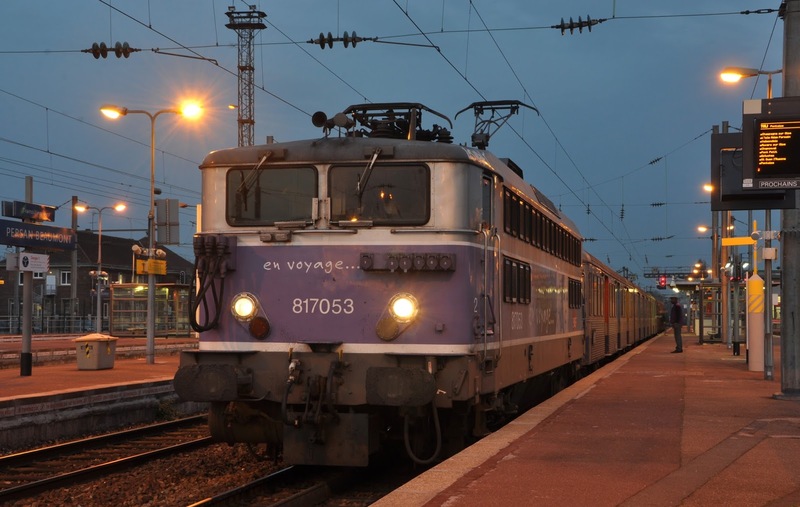 BB17053 on a Creil to Pontoise train at Persan Beaumont. I had had enough of the alarms and jumped off at Ermont Eaubonne hoping for something more 'real' into St Lazare. I was to be disappointed with at least 3 Francilliens on the Ermonts. I endured one back to Argentuill before picking up a Prima and some less annoying stock back into St Lazare. BB17024 was stabled on RIO stock, and I had seen a couple of others out on my travels- very much reduced though compared to my previous trip. A little more sightseeing before being whisked home all too soon by 3011/3012. Not the most fruitful of weekends loco-wise but I always enjoy a trip to Paris. The weather made up for a lot- it was gorgeous! Sunny and warm- I tired of carrying my coat around all weekend. Loco haulage continues to diminish within the Ile de France so it was good to still find some of the older locos- even if it was a struggle at times. 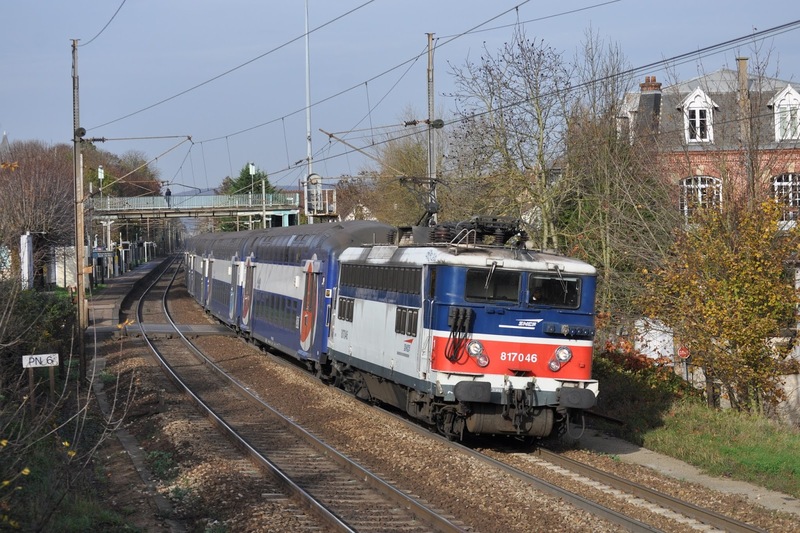 Runs on the Big diesels out of Est are always good fun- but even a trip to Nogent sur Seine is reasonably pricey. I was hoping to see some Z5300 units at Melun, but did not see any working. I suspect many of their remaining turns are weekdays only now- though I was only at Melun for 30 minutes on a Saturday night. As usual I had absolutely no problems or bother with SNCF staff with regard to photos. Everyone I came into contact with being very friendly. While Paris is becoming more difficult for trains I'm sure I'll be back again- maybe on a weekday next time.